Being a Yes fan for all of my adult life pretty much means it is prerequisite to enthuse about the work of Steve Howe. Steve is a virtuoso guitarist and always commands attention whether listening to via your preferred medium or watching his always lively performances. Nexus finds Steve teamed up with son Virgil who sadly prior to the release of the album passed away. This you would think could add a tinge of sadness to the album. Not so, with the awareness that one of the key players here is no longer with us it adds an element of tribute, celebration and beauty to many of the compositions. Until the recent tragedy i knew little of Virgil Howe though his immense talent shines through in the writing keyboards and drums throughout Nexus and instead of trading on his famous dad’s good name at times places him as an accompanying musician. Many of the compositions here are pieces written on piano by Virgil and then sent to his dad for some of his magic embellishment though the picture is much wider than than that i suspect. I have to admit that i was totally unsure of what to expect from this album having surfed the net to find out more about Virgil Howe, though i was keen to find out. 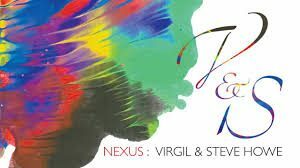 Opening with the title piece Nexus in an almost classical way Virgil’s crisp piano and drums were wonderfully augmented by Steve Howe’s signature slide guitar so often feature throughout classic Yes songs and opus. The recording has an honest quality about it the piano having a natural timbre and drums caught in a live fashion with real attack and decay. 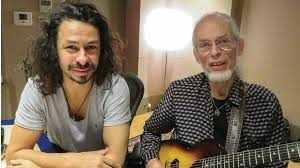 Time and patience have been lavished upon what must have been a labour of love for Steve Howe. Though a an overall sound exist throughout the album varying styles and musical flavours and influences creep in from time to time. None more so than Hidden Planet where i detected a little Roy Budd going on with a hint of Get Carter lurking in the wings. Perhaps the Zither like sounds or the lower notes of the piano being used. The use of a Claptrap type device moves the tune along quite nicely and a sense of more than just musical bonding between father and son here methinks. Another signature acoustic guitar and piano intro soon merges with rich and astral feel on Leaving Aurora. Lots of analogue keyboard sounds reign which made me think that this may have been what Steve would have sounded like if he had recorded with Vangelis instead of ex Yes cohort Jon Anderson. The space nature and references here seem prevalent throughout the album, something i enjoyed both in a contemporary and retro fashion. An exception to this of course is Nick’s Star. A musical ode to Virgil’s friend Nick Hirsch a fellow band member who had passed away in 2012. This song had been recorded in an earlier session to the Nexus recordings though no trace of that can be heard. Once again the now familiar piano intro melded beautifully with the expansive keyboard swathes and dads cajun-like slide Dobro / acoustic slide guitar. Following on is the very busy and eclectic Night Hawk proving to be a workout for the speakers such is the full on sound stage and intricacy of the interplay. As the title suggests Passing Titan is very spacey indeed, Steve How leading here with an interesting electric Sitar with Virgil adding some atmospheric Rhodes to further enhance the galactic feel. This Along with the equally trippy Asrtral Plane reminded me of the late Peter Bardens (Camel) employing as it does a real MiniMoog together with a myriad of vintage keyboard sounds and Bardens love of all things space evident on albums like Camel’s Moonmadness and his solo album Seen One Earth. Concluding the album is Freefall, which is tranquility incarnate. Not as grand as i would of expected to end such a venture. In fact it wouldn’t be out of place on a relaxation album. All in all this is a fine album though if you are looking for Starship Trooper, Yours Is No Disgrace or The Clap revisited then dig them out because this is literally a world away from them. 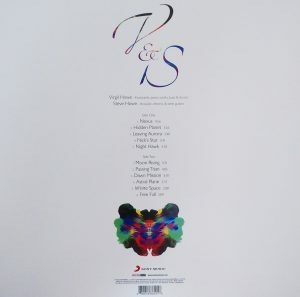 I reviewed Nexus in both digital and analogue formats and preferred the vinyl album better as it had greater depth creating another dimension, adding scale to the already fine recordings of some captivating pieces. Lovers of soundtrack music like myself will simply adore this album, yet it’s heritage and meaning will appeal to many of Steve Howe’s followers and those of his son Virgil too. A fitting swan song for Virgil Howe, more than a duet with his father, instead something more binding and a treasured memory.